It’s no secret that the App Store is a wild success, housing well over a million apps for their mobile devices. It’s also no surprise that a good deal of these apps capitalize on the trendiest apps out there - remember Flappy Bird and its many imitators? For years, it was unclear how so many of these blatant ripoffs could make it through Apple’s strict review process while others would be rejected for seemingly no reason. That is until last week, when Apple released a comprehensive list of the major reasons apps don’t make the grade. 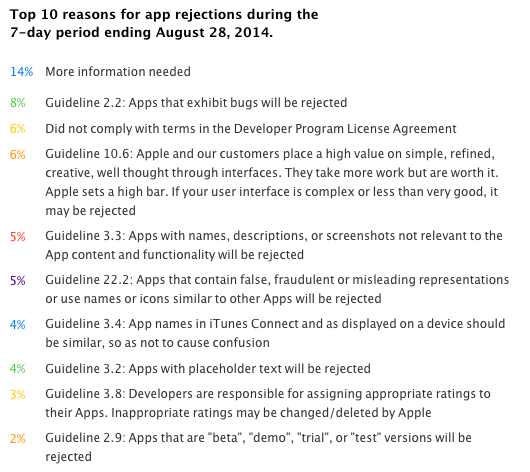 Apple breaks down the top 10 reasons for app rejections in a 7-day period ending August 28th, 2014. The biggest offender (at 14%) was that more information was needed. Ultimately, this comes down to developers not submitting valid demo information (i.e. videos or accounts). Many of these issues fall on developers failing to comply with various guidelines. 8% of rejected apps exhibited bugs too noticeable to overlook, while 6% didn’t comply with Apple’s License Agreement. Another 4% of apps still contained placeholder text. Some apps (2%) were still in beta. Oddly enough, Apple does refer to a guideline restricting apps that contain “misleading representations or use names … similar to other Apps” as grounds for rejection. Although this mostly refers to apps using fraudulent icons, hopefully Apple is also cracking down on imitator apps on the whole. While it’s unclear whether Apple will continue to update these metrics on a weekly basis, Apple’s transparency in this matter will surely be of great help to the iOS Development Community. Ideally, developers will be more careful to submit more complete versions of their apps, leading to lighter queues for App Store reviewers and quicker approval times. Ultimately, Apple has reinforced its investment in the Developer Community. Hopefully, this will lead to greater innovation - and the Flappy Bird imitators going the way of the dodo.